Pro tapes Pro flex patch and shield tape is an all weather, flexible butyl patch and shield repair tape. It is the heaviest, most aggressive sealing tape available. UV resistant for assured longevity. Quick, permanent repair. All weather application. Convenient ready to use patch sizes. Extremely effective in below grade concrete wall penetrations for water. VOC Free. Conforms Easily. Stable form -70 to 200 degrees F. It can be used to reinforce non-leaking seams and for additional security around curbs, vents, chimneys, AC systems, antennas or any roof-penetrating devices. This tape is easy to apply to any clean, dry surface. It is flexible and readily conforms to shapes, making it well suited for gutter repairs, piping or other curved equipment. This product is also recommended for use when stopping leaks on mobile homes, RVs, rail cars, trucks and vans, garden sheds, tarpaulins and some unpressurized piping. Low temperature application. Short term, high temperature resistance. Outdoor use. Highly conformable. Good chemical resistance. Good solvent resistance. UV resistant. Good moisture resistance. Waterproof backing. Weather resistant. Low temperature flexibility: excellent. Thickness without liner: 28.0 mils (+/- 2-mils). Tensile strength: 15-pounds per inches. 25 degrees F Peel adhesion: 13-pounds per inches. 150 degrees F Peel adhesion: 2.2-pounds per inches. WVTR at 73 degrees F/50 percent rh: <0.02-grams /100 in 2/24hrs. Permanence at 73 degrees F/50 percent rh: <0.05 per ms. Elongation: greater than 700 percent. Adhesion: 20-pounds per inches. Adhesion to backing: 14-ounces per inches. 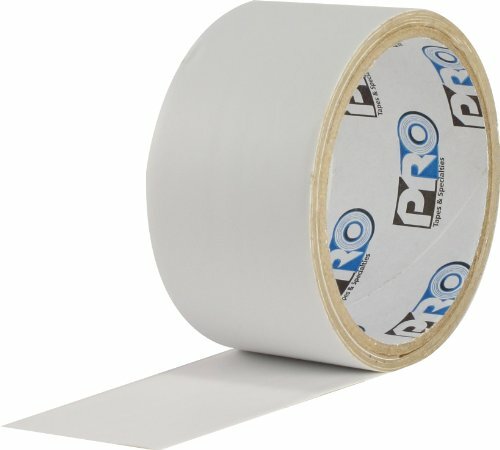 Application Temperature: 20 degrees F to 170 degrees F. Service temperature: -70 degrees F to 200 degrees F.
If you have any questions about this product by Pro Tapes, contact us by completing and submitting the form below. If you are looking for a specif part number, please include it with your message.